This easy-to-follow Indian cookbook allows home chefs to recreate their favorite dishes with delicious results. 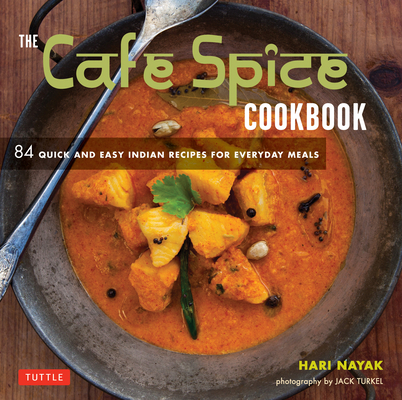 The Cafe Spice Cookbook presents delicious Indian recipes featuring all-natural ingredients that enable one to create delicious meals in minutes. It is inspired by the Cafe Spice line of "grab n' go" Indian meals found in Whole Foods and Costco, and now on college campuses across the U.S.A. This Indian cooking book provides you with all the instructions you'll need to prepare healthy Indian food anywhere and anytime, using ingredients available at any supermarket or health food store. Tempting offerings like Chicken Tikka Masala and Shrimp & Mango Curry will thrill your friends and delight your family. Hari Nayak is part of the creative new generation of chefs from Asia. As a young boy, he watched his grandmother grind fresh spices in the traditional stone mortar, and heard the splutter of curry leaves being thrown into hot oil, and knew that being around good food was what he wanted to do, always. Hari is known for his simple approach to food, staying true to the core Indian values of the dishes he creates. His inspiration, apart from his village upbringing, lies in an ability to absorb influences from other cultures and cuisines that he has experienced in traveling the globe. Since graduating from the Culinary Institute of America, Hari has worked in the food industry for more than 15 years--including stints at renowned New York restaurants like Aquavit and Daniel. His other cookbooks include Modern Indian Cooking and My Indian Kitchen. Hari lives in New Jersey and appreciates everything that cooking has brought to him. Jack Turkel has been a professional photographer for more than thirty-five years. From the space shuttle and mountain tops to the uniqueness of his photographs of the everyday, his creative eye has expertly captured an impressive list of subjects and settings. He did the photography for both My Indian Kitchen and Easy Indian Cooking. He is now focusing his experience on the art of food photography and styling.